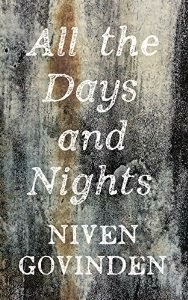 I am appropriately grateful to Madeline Toy, former publicity manager at Transworld and now freelance book publicist, firstly for her kind offer and secondly her even kinder gift of Niven Govinden's new and yet-to-be published (as of publishing) novel, All The Days And Nights, published by The Friday Project* and available from all good bookshops, and some bad ones, from the 25th September. She may be the first person since I decided to gently solicit free things to read to actually send me something, for free, so if nothing else deserves an honourable mention. Therefore this review entails an attempt - my favourite disclaimer and apology for eventual failure - to curtail my own facetiousness, cynicism and puerile theatricality to give due consideration to the book itself. First impressions left me confused. The title rang bells so I checked it out. Of course, the link to Glen Duncan I could dismiss, but it was a surprise to see the same title on a collection of William Maxwell stories. Maxwell, not my favourite author but someone whom, along with John Cheever, I consider an Important American Author, was forever writing thinly veiled autobiography, the moments of his own life soaking into the pages of his novels and short stories like a spilled ink-well, but I couldn't make the connection to Govinden, considering he was born in Sussex and has probably never been an artist on canvas, or the ageing lover thereof (but of course I can't be sure). I am probably over-reaching, looking for connections no matter how coincidental, particularly as this is the first of his novels to have graced my bedside table, but it rankles, and as a less-than-sympathetic reader at times anyway, the tiny objective voice inside me groaned at the inevitable overspill of rancorous bile to follow. Ah ha! But what did follow was not all venom and hatred, not from me at least, and past the trepidatious opening passages, where nature is invoked in unnatural outrage at some transgression, I was quickly lost in admiring this beautiful book. A quick plot summary, and what we have is one elderly and, as is slowly revealed in the book (but put on the cover just in case you missed it) slowly dying artist, Anna, at home with Vishni her live-in housekeeper and often-times subject, ruminating on the absence of her other live-in subject, sometimes lover, legal husband but originally transient farm labourer, John Brown (no relation prior to marriage). Into the picture comes friend and agent Ben who sits in whilst Anna paints what is likely to be her final piece before she dies. Reducing it to bare bones doesn't make for a compelling argument to read. However, on these bones hangs a wistful, or rather more strongly described, a longing-filled novel about a woman, her muse, her art and the complicated palimpsest that makes up her love for the now missing John. She imagines his story, independent of her, as she goes about her work, fleeing across the country away from her illness, ostensibly to view the paintings of him scattered across the continent (and there appear to be many) - "I'm seeing all there is to see. I want to study things, paintings, the way people study me," he says to her / their financial manager. What's not clear is how much of what she tells of his story is imagined and what is reported by the people with which she interacts as a result of him having paid them a visit. Nonetheless, Anna's view of things seems crystal clear, her narrative - both her own and that which she tells on behalf of absent John - punctuated with insight and truthfulness, or verisimilitude, as each perpetrated deception is acknowledged without comment and considered with compassion; Ben's personae slipping between friend and agent, casting covetous glances at the stacks of canvases in Anna's studio, is accepted as a part of his being; John leaving without notice is accepted as it was expected, barring the opening passages where there's a little bit of lamenting going on. She is not, however, particularly sympathetic. She can't control her own need to find and represent an essential truth in her paintings of John, and pushes him to sit for her, somewhat cruelly, after failing to resuscitate a friend's drowned son, and after finding a dog dead from a traffic collision. She is relentless and calculating, exploiting her muse and her housekeeper, making sure that whatever else might be reciprocated in her relationships, her need is satisfied first. Govinden has a particular power in his writing that pushes back your defences, or at least in my case was quick to overwhelm innate cynicism. The passage in the book, about halfway through this fairly slim novel and an exchange between John and the financier in his car, where Anna relates John revealing she is dying (and hints at his own imminently anticipated demise) is worth reproducing in full**. - The doctor says things, and his words hang in the air. Feels as if we're offered an unwanted gift. Something we'd rather not touch or acknowledge. Except it comes for her whether she wants it or not. - There are second opinions. Other avenues. Doctors can be changed if their manner is too brusque, although I always thought that plainness of speech would be something she'd appreciate. - She's dying. Something that I can't mention or acknowledge in her presence. It's easier to take myself away. Easier for her. She shouldn't be distracted by my face and what it betrays. - Even without looking at you your worry swamps the car. It must've been tough in the house. Knowing your body can betray you, the way hers is betraying her. It might have been the wine talking - I was alone in a dark cabin, on tumultuous seas, with a good bottle of Bordeaux and a plastic cup - but it struck me as perfect, and I felt sucker-punched, particularly as just prior to this I was chewing over the complaint that the one thing this book doesn't do well is dialogue, where every exchange seems overly formal, stilted, unnatural. Yet this passage, entirely in dialogue, drove me to bend the corner of the page down so I could find it again quickly. I am haunted by this novel; saddened and chastened and not a little tearful on finishing, and it's taken me a week or two to get over myself and put these words out there to consider. Govinden is the kind of gentle modernist that contemporary British fiction needs; entertaining, intellectual, emotional, poetic, fabulous. *An objective review of my reading habits, especially after a recap of selected holiday reading, shows that the publicity activity of The Friday Project has exerted a significant influence over what I read and, to a lesser extent, when it gets read. Well done publicity team. **With the disclaimer here that this is quoted from a proof copy and may or may not be representative of the final published version, although I bloody well hope it makes any final cuts or else I may revise my opinion.